Suliman Abdulmagid Osso was born in 1959, graduated and got a bachelor certificate in Mechanical engineering in Aleppo university in 1986 , a member of the political committee of Yekiti Kurdish Party, the member of the foreign relationships in the National Kurdish Council, NKC, married and has got six children , joined to the political Kurdish movement in Syria in late 2970s when he was a student at secondary school in Hassaka city.When he moved to Aleppo to study at university, he worked in the responsible committee of the Students organization of al Shaghila Kurdish party . Then, he elected to be a member of the regional committee of the same party ..After that, he had been elected a member of the central committee in the second conference.as well as elected as a member in the Dialogue committee of the three United Kurdish Parties , Al Amal, Itihad al shabi and Shaghila. The first time Osso was arrested in 1992 after the common leadership of three parties published a poster on the thirty anniversary of the exceptional statistics in Hassaka province accused by cutting off part of the Syrian territory and annexing it to a foreign country, opposing the objectives of the revolution and spreading false news that can motivate the sectarianism and racism . He remained in prison a year and six months .The three parties united united under a new label, the Yekiti Party, and Osso was elected in absentia as a member of the new Central Committee of the new party . He was elected a member of the political committee of the Kurdish Yekiti Party in Syria in its fifth conference . Osso was arrested again in 2008 the night before Nowroz Eid , the national Eid of the Kurdish people, because he was the supervisor of the Nowroz Festival Theater. He had been Pesented to the Military Court in Qamishli , he was released on bail after three months in the central prison in Hassaka City. The trial continued until they were included in the amnesty decree . Osso was arrested agian with 90 people in Damascus in 2009 after participating in a sit-in in front of the People’s Assembly in protest against Decree 49 about Special Commission in tue Kurdish areas in Syria . They had been released in the same day at night . In the same year, Osso was arrested by the Political Security after a sit-in in Hasakah in protest against the same decree and was released the same night. 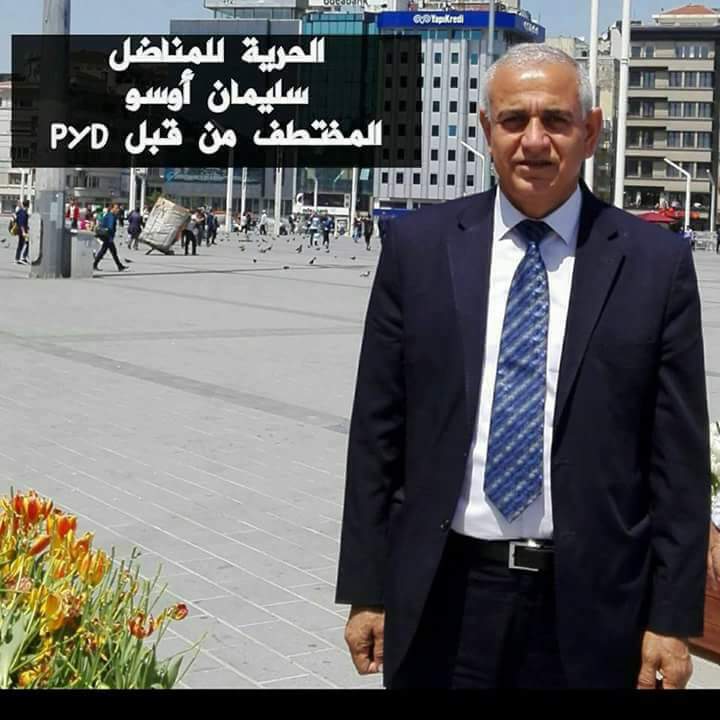 On November 17th , 2016 , the Asayish , armed groups , of the Democratic Union PYD arrested Suleiman Osso with five other leaders and two members of Kurdish Yekiti party in Syria after they had opened the Yekiti Center which was closed by PYD . The Asayish had released Hassan Saleh and Sabri Mirza the next day and released Osso and the others after a week . On May23rd, 2017 , again the Asayish kidnapped Suliman Osso from his house in Kamishli city to be transferred to Allaya prison to be arrested in till now .